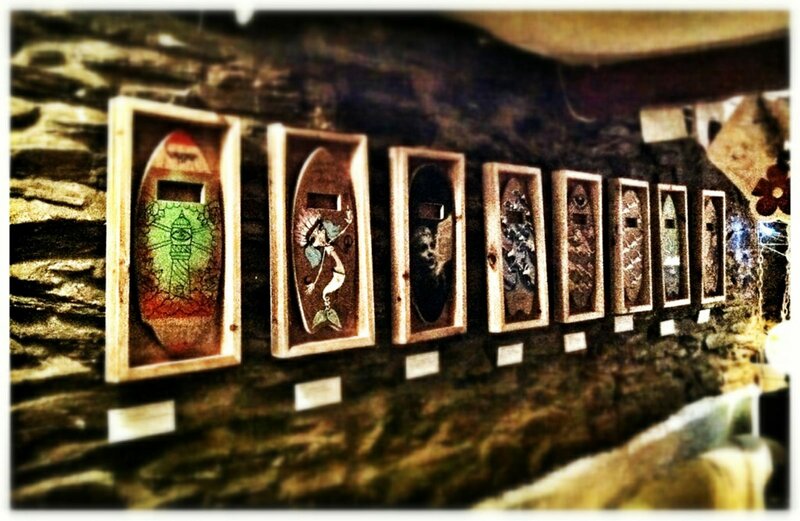 Karl Mackie, soul surfer and artist, held his first solo exhibition in Newquay at the weekend. Very much a product of his environment, and influenced by the renaissance in analogue photography, Karl showcased surf art combined with classic British seaside imagery. The venue, Cafe Irie in Newquay, itself an embodiment of travel and surf culture within Newquay, was well suited to the subject presented. The exhibits ranged from Lomography to a somewhat unconventional hand shaped surfboard. The purpose of which was to provide the artist with as much pleasure from the process of creating the board as from the function. Also featured was the Hand Plane Art Project. Karl started to produce wooden hand planes several years ago, whenever the swell meant it would be more fun planing (a form of body surfing) than surfing. A change of direction earlier this year lead Karl to turn them into art pieces. Karl sent his hand planes around the world to a number of artists and asked them to carve, paint, draw or tattoo whatever they wished onto the hand planes. The result is a collective work, each hand plane as unique as the individual artist, and reflecting a unified love and respect of the Sea. For example, Chris Del Moro, pro surfer and active member of Surfers for Cetaceans submitted a piece to highlight the wider responsibility of surfers as caretakers of the oceans. This is a project that has grown organically, and will hopefully continue to grow. I have known Karl for many years as a work colleague, and understand the challenges of balancing subsistence in Cornwall with the need for personal fulfilment. I found the exhibition inspirational for the creativity Karl has demonstrated through making opportunities’ for himself. Karl’s exhibition runs until the end of February 2012.